I consider video games an art form. Some people, famously including Roger Ebert, would disagree with me, and that’s fine. It’s harder to dispute, though, that a large amount of art goes into video games - concept art, 3D modelling, creative writing, musical compositions, and more, all to create one cohesive work. It’s easy to ignore all these parts to focus on the whole, but often times this work deserves to be appreciated in its original form. In Japan, game developer Square Enix has been publishing a series of art books for many of the games they release, including the Final Fantasy series. Called “Ultimania,” these books are full of treasures for fans of the games. Along with full-page copies of character portraits and concept art, they have insights into other parts of the game development process. There are pages full of handwritten story treatments, including parts that were cut or changed from the final product. Interviews with developers are also included. Previously, the Ultimania books were only available in Japanese, and fan translations of the books into English were incomplete and unreliable. However, Dark Horse Books has released the first in a series of new English translations. 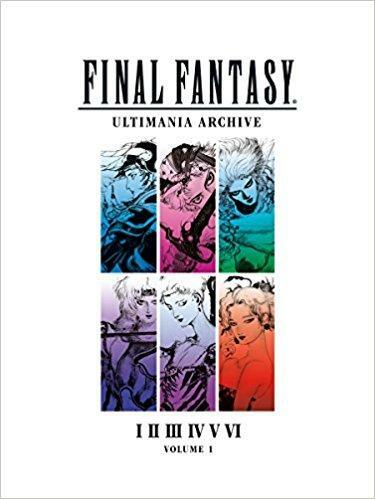 Called Final Fantasy Ultimania Archive, the hardback book is huge and beautiful - it’s more than 300 pages, printed on heavyweight glossy paper, and in full color. It covers the first six Final Fantasy games, including all the times these games were re-released on newer platforms. The book is fully translated, even containing all those handwritten notes. Later this year, the second volume will be released. It covers Final Fantasies VII, VIII, and IX, and is even longer than the first book. I’m looking forward to this one even more than the first.